Before we discuss sleepwear, it’s good to understand a bit about flammability requirements (because I know my dear meticulous, environmentally-conscious readers want to know 😉 ). The vast majority of severe burns occur to children while wearing pajamas around fireplaces, candles, furnaces, parents who smoke, etc. (although this is less frequent today than in the past). Consequently, the CPSC requires sleepwear intended for children between the ages of 9 months and 14 years to meet specific flammability requirements. *Note that sleepwear for children under the age of 9 months is not subject to the requirement, mainly because these infants are not yet mobile. Before you say, “My kid would never play with a candle (etc. ),” remember: kids love fire and they do stupid sh*t, especially when you’re not looking, so this requirement isn’t necessarily a terrible idea. Snug-fitting baby pajamas are not treated with flame resistant chemicals because they are less likely to be ignited and they burn far more slowly. 2. The garment can be inherently “flame resistant” if made with fabrics such as polyester (e.g., “fleece”) or wool. Please note that polyester is made of oil which is highly flammable; however, in the polyester development process, the fire retardants are bonded to molecules, which gives it flame resistance. For that reason, polyester doesn’t have to be additionally treated after the manufacturing process. Wool is naturally flame resistant; therefore, it is free of fire retardant chemicals. Although usually pretty expensive, Merino wool is the gold standard in sleepwear if you can afford it (buy used?). 3. It can be treated with chemical flame retardant(s). You generally can’t tell what flame retardant is being used on any particular clothing item unless you ask. And no, you can’t really “wash it out” either (it takes a LOT of washing). Many parents are not keen on chemical flame retardants on their kids’ clothes. In real life, what this means is that jammies you see in most stores are usually either snug-fitting OR made of polyester/fleece. If the jammies you are looking at are not one of these, they are likely treated with a chemical flame retardant(s). Those pretty princess nighties from Disney and such? Yup. All heavily treated. For those of you who aren’t into “baby” designs, check out Leveret pajamas. They offer mostly stripes with a few exceptions in cute designs. Leveret pajamas are fairly priced, super soft, stretchy and fit great. *They do run a little big – so get your baby’s correct size and let them grow into them. 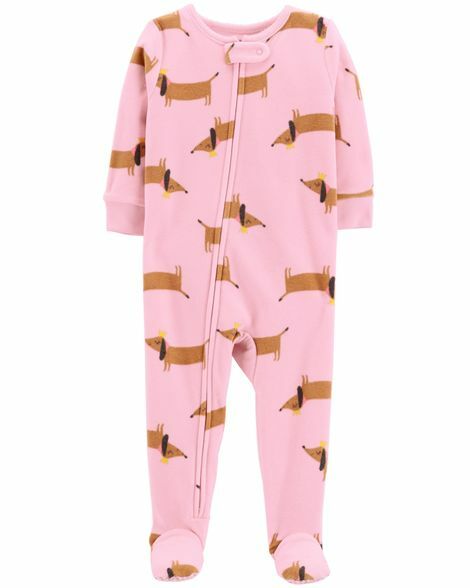 A crowd favorite, these polyester footies will keep your little one warm on the coldest nights. Note that polyester isn’t exactly known for its breathability, so watch out for overheating. Carters has also released their fleece jammies in footless styles to help with overheating concerns as well. Don’t miss out on boys styles, head here. Another budget favorite are Old Navy Sleepers. We love this quilted version, but their performance fleece are great too! *Per Gap, Inc.: “Information on flame retardants is proprietary and can’t be shared with the public.” – Umm, that’s shady! Hanna Andersson jammies are my personal favorite; although they aren’t the cheapest, they are very high quality. I mean, they are SERIOUSLY well-made and have lasted through both of our sons and handed down to family friends at this point. No matter how many washes, colors stay true, don’t fade and the fabric integrity is impeccable. Most of them are made with organic cotton, hurray! Woolino, makers of one of our favorite merino wool wearable blankets, also makes a wool footed pajama, might I add that it’s also tag-less. We love this pajama because it’s made of superfine merino wool, which naturally regulates baby’s body temperature – won’t overheat and won’t wake up cold. Seriously, merino wool is the shizzy. Wool is a wonderful fiber because it breathes, wicks away moisture, is soft, and is naturally fire resistant. A little pricey, but it’s super durable and will last – worth the $$! *Been using these with my kids for two years now, and they remain my absolute favorite!! These warm robes are perfect on chilly mornings (size: 2T to 4T).